Opened in 2017, the Peninsula Kayak Company is located 13 miles north of Sturgeon Bay, and just 2 miles south of Jacksonport on Highway 57. 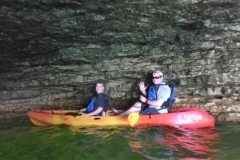 From speaking with the owners, they say they are a small kayak outfit that offers guided tours along Lake Michigan with views of Cave Point, and Whitefish Dunes State Park. They also offer Eagle Harbor tours out of Ephraim. The tour wraps along the shores of Peninsula State Park, Eagle Harbor, and the Eagle Bluff Lighthouse. We also offer wetlands tours along Logan Creek and Clark Lake. See below for more details about each tour. Cave Tour: In this tour, you will explore Cave Point (which is gorgeous in our opinion) and Whitefish Dunes magnificent coastline (which is very cool). You will have a great day on these crystal clear waters, with limestone bluffs and caves. In fact, the escarpment that makes up Cave Point is part of the Niagara Escarpment - yes, as in the Falls! Beautiful! Logan Creek/Wetland Tour: This is a perfect fit for beginners, though no experience is necessary for any of the guided tours. ISituated along the north shore of Clark Lake, Logan Creek is an undeveloped, isolated gem of Door County. Logan Creek is tucked away in the quiet side of the Peninsula, and her pristine waters are designated an Outstanding Water Resource. If you arrive early in the season, the banks of the creek are alight with the vivid yellows of the marsh marigolds, and soft whites of the American starflower. The only noise you will hear along Logan Creek will be the wind through the forest, dominated by white cedars, white pine, black ash, yellow birch, balsam fir, and hemlock. Launch from a private location and within minutes the only sound you hear will be the occasional ovenbird, red-eyed vireo, black-throated green warbler, eastern wood-pewee, great crested flycatcher, rose-breasted grosbeak, and hermit thrush. A year-round habitat for waterfowl of all kinds as well. The paddle continues onto Clark Lake to the north shore of Whitefish Dunes State Park. Also great for paddleboarding, and a real family treat too. Very cool! Sunset Tour: Sunsets in Door County are like no other place - they are simply spectacular! And see a sunset whilekayaking - perfect! This is a great tour for couples, of course. Sunset tours launch in Ephraim about 90 minutes before sunset. You will be dazzled with the tremendous array of colors in a Door County sunset - something special every time! You really do not need experience on these tours. And they say, if you have your own kayak, you can come along as well (not sure what the fee is on this one.). As of this writing, the tours are $45-$50 per person, but always check with the company to find out current pricing. Things change! They try to be very accomodating, and will usually have from 1 to 12 people on a tour. But, if you have a larger group, please call them ahead of time with the details, and they will work with you to try to accomodate whatever you need. Cool! 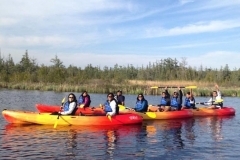 You should plan on a total of three hours for your tour, whichever you choose, which would include checking in, paddle orientation, safetly lessons etc. You can rent kayaks and paddleboards are fair rates as well. So if you are a do it yourselfer, rent what you need right here! Five stars only because we can't give 10. The best experience of our 10 day vacation! !Worked with Dane and Keeley to get it set up (and rescheduled due to weather) and they were SO helpful, accommodating and nice.Robert took out my husband, 11 yr old son and I. I had not kayaked before, and not only did he help me in and out of the kayak gracefully (some of us are no longer young and agile), but he gently and succinctly coached us so that we were maneuvering in, out and around in the caves like pros! AND Robert took pictures for us so I wouldn't have to worry about dealing with a camera and could just focus on having a good time - I still got my Kodak moments!!!!! - Catherine F.
Tour leaders were great, and very knowledgeable! I would deffinately go again! - Kristina M.
Awesome Staff! Really cool waiting area outside! Would def go back! - Eric O. Our family had a great time with Keely on the Wetlands tour. It was our girls first time kayaking and our guide was very sweet and informative. The creek was very calm and we went out on Clark lake which was easy paddling for the kids. Keely even let us get out and walk in the lake for a bit which the kids absolutely loved! We also got to see some wildlife while paddling through the creek. It was only our family on the tour which made it that much better. Would definitely recommend to anyone who is a beginner with kids! - Brittany K.
So check out Peninsula Kayak Company and be sure to tell them that DoorCountyNavigator sent you - that helps!